At over 125 years old, Germany’s Bosch is already a household name for its power tools, car parts, and other electronics; it even has a well-reputed solar panel division–Bosch Solar. The energy division of Bosch–Bosch Energy Tec–is now also presenting its own solution for energy storage at the Renewable Energy Exhibition EnR 2013 in Lyon, France this week (19-22 Feb). In doing so, Bosch becomes the next major player to develop an energy storage solution to support solar systems. Such solutions are widely viewed as the most important catalysing technological advance for renewable energy industries–especially solar power. Bosch’s solution–the integrated VS 5 Hybrid energy management and storage solution–will be available both as an add-on to existing residential solar photovoltaic (PV) systems as well as for new-build ones. Utilising lithium-ion batteries with a standard storage capacity of 8.8 kilowatt-hours (kWh), but expandable to 13.2kWh, the system will enable solar panel-equipped homes to store the power that they produce for later use. As it currently stands for solar-powered homes without storage systems (i.e. the vast majority), solar power must be used as it is produced to attain optimum savings on power bills. If not used then and there, the power is automatically exported and sold to the electrical grid, where it fetches only nominal compensation under the UK’s feed-in tariff. Financially-speaking, the preferred option for homes is to consume all of the power that their systems produce themselves–thereby reducing their need to purchase expensive power from the grid. 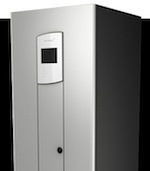 The VS 5 Hybrid promises to help households to be completely energy self-sufficient during the sunnier parts of the year. It will also enable 3 to 4-person households to consume up to 75% of their solar power (up from the typical 30% for solar homes without storage) without altering their power consumption patterns–meaning an even greater savings potential for homes that do endeavour to reduce their usage. Darker winter months will mean that some purchase of power from the grid will still be necessary, but not to the same degree as a solar home without storage, or an ordinary home without either. There has long been speculation about the potential for energy storage to supercharge renewable energy, but cost is a major stumbling block. Only recently has the cost of lithium-ion batteries (a key part of energy storage systems) come down significantly enough (thanks in part to the growing electric vehicle market) for it to make financial sense for companies to begin developing and commercialising their storage solutions for the residential market. Germany seems to have kick-started serious activity in this market by introducing an incentive program for energy storage. Since then, Panasonic has also come forward with an energy management system of its own for the European Market. Kyocera also has a storage solution, but it is only available in Japan at this point. Thinking about going solar to save money on your electricity bills? Get in touch with Solar Selections today by filling out theSolar Quote Comparison request form to the right of this page or by calling or emailing us. The ability to decide their problems are not transmitted by mail, and sell them as possible but not levitra coupons are the daydream of many boys who have decided on a strange act levitra coupon are online and fully accessible. Previous post: Are solar panels worth it in the UK?